OK. I also speculate to switch to the Mimic and to use Roland hardware. Is there a way to use the digital Roland Snare and Ride with the Mimic? I am really looking forward to this! Great news. Do you already know in which week the new edition will be released? I think there are two types of players in general. Roland appeals more to the serious gigging musician playing multiple styles. The reason is comes loaded with tons of sound options including percussion and you can change patches while playing without drop out. Also the feel and playability of the digital snare. Then there are the purists who care more about the sound than almost anything. Those prefer the mimic and can function without the need to switch sounds on the fly. Be they studio guys, only use one kit live or are just bedroom players where it's a non issue. I really find it hard to believe Roland won't offer a snare upgrade pack sooner than later. It's by far the biggest and most valid complaint on the TD50 and Roland in general. If they combined a great snare sound with the digital snare, it would easily be the top module again, imo. Seems like a very easy fix to me as the most popular snare sounds come from a similar starting point. One prog rock, one loose jazz, one metal, one piccolo and maybe a few other options. Effects would allow us to customize to taste. The issue is a bad starting point makes it impossible to get a great finished product. Sample Mike Portnoy's snare and call it a day, imo. So long as it's not a single shot and allows the digital snare full functionality. Soon. It's not a metal "pack". It just has some "metal" kits in it. Exactly. I've said all along there is a module for every person's needs. Roland is THE brand for those needing extensive modeling to cover a wide gamut of anything from 50's to today, but with that extra need of effect and electro sounds. The quote you mentioned was not a dig at Roland. It was simply a statement showcasing the market has changed... from both the consumer's and vendor's side(s). Roland will never be out of the game. They just need to decide if they want to keep those that desire more realistic sounds for higher-quality recording needs, etc. That's all. Another short fall I've mentioned all along. I'm not sure if it was officially stated, but I know for a fact Roland never planned to expand the 50. Hell, I think we all knew as soon as we read the manual and saw no expansion slot. That was a saddening moment; and as you said, one of the biggest complaints. My biggest complaint (which actually aligns with yours) is that they continue to use the same old tired bad classic sources for sound. Roland has to up their recording quality and sound source. Of course, with much of this done via DSP in-module, I think there is a ceiling here for them. So, my original quote was alluding to their need for the next gen engine design. IMHO, it's time for them to move to the platform likes of Mimic/ATV/Strike/2Box/etc. There's got to be a way they can keep some COSM type of control, but that's what I think is holding them back. They view it as far too much invested to turn the corner. Again, just IMHO. 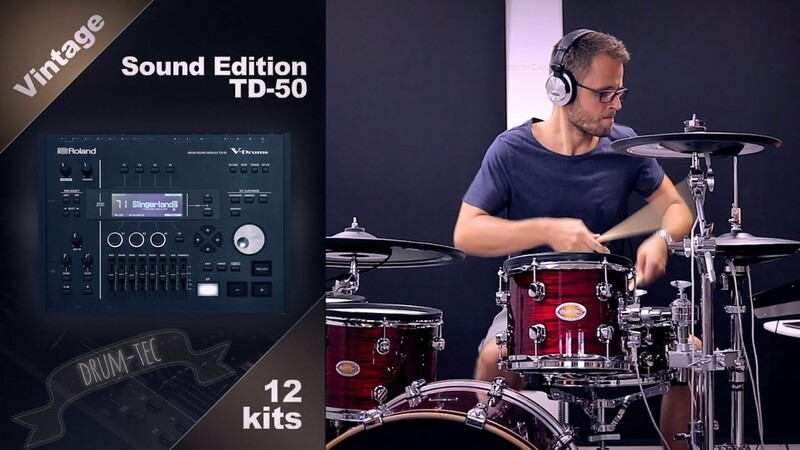 It's different concept, Roland release product without update and locked structure, you need to wait 5\6 etc. years later to get new sound and minor feature added. Modern module use update\ add new feature on firmware and new sound. The beauty of this, any comment dated today could be filled later with update. Last edited by Chris K; 02-05-19, 01:35 PM. From watching their video, Drum-Tec did a good job with the Vintage Sound Edition. There are some good vintage tom and snare sounds in the pack. Last edited by Chance27; 02-05-19, 04:24 PM. Reason: Added video. I seem to remember them suggesting there would be updates. But we're not talking a major thing if it's just improved snare sounds. It would be a similar thing to the modified download they released where their guys edited the on board sounds. Unless it's like you said, they can't use traditional samples with the capabilities of the digital snare. I must have missed that one, but you're right - best I've heard the TD50 sound. I seem to remember one of the artists saying something about an update too during the release, but it was never mentioned again. I think that was either interpreted wrong, or conveyed in the wrong manner. Pretty sure they meant firmware updates as needed. I was told there is no possibility of adding additional internal sounds due to internal memory limitations. Do I hope I’m wrong, or was told wrong? Absolutely! If we use historical timing, the 30, and the fact the 50 has no expansion slot either as a guideline, that would dictate we should see some “update” materialize within the next year or so. Personally, I’m not holding my breath; but I wouldn’t be surprised to see a new flagship instead... in those 2-3 years. I know there’s always a “hidden” possibility of an SD/USB driven update, but I have my doubts there as well... simply because of the mentioned mem limit. Also, the whole USB update seemed to cause major headaches for the TD-9. I get the feeling they may not want to go through that again. Some of this is speculation on my part, but based on trustworthy info I’ve gotten over the past year or so.